The Bosch is a workhorse; designed to easily handle heavy loads, like several loaves worth of bread dough or a triple batch of oatmeal raisin cookies, repeatedly. We make four loaves of bread twice a week in ours, but it can handle even more than that. Its specs make it sound more like a car than a kitchen tool: 800 watt motor and a transmission so strong that fewer than 1% have failed in 20 years of heavy use. When my husband buys a tool for his shop, he insists on buying the one that will outlast all other similar tools on the market. When I choose a kitchen tool, he requires nothing less. We got the Bosch, and we love it! The Bosch Universal Plus Mixer and Nutrimill Grain Mill are natural companions. Grind fresh flour for all your baking needs. Hi! My name is Emma. Last summer, my grandma gave Mom a Bosch as a gift because she liked her own so much. Until then I, as the official bread maker, had been kneading the bread by hand. It was working fine, but it took up a lot of the time I would otherwise be spending on something else. When we got that Bosch, things changed! I am now able to knead the dough in the machine while I clean the kitchen or work on school work close by. The bread it makes is wonderful too. It turns out very light because of the great kneading the Bosch gives it. I think this is a great machine to have around. It has made my job tons easier! French whips (whisks): Triple action turns a single egg white into 1.5 cups meringue! Warranty: 3 years on motor and transmission, 1 year on other parts. • Updated motor: The new motor has 4 times the life expectancy of the older version. • Updated transmission: The new transmission is supposed to last twice as long as that of the older model. • Bowl Capacity: The bowl now holds up to 8 loaves worth (15 lbs) of bread dough. I believe the older model could knead 7 loaves of dough. • The drive shaft is now removable by simply twisting it from the bottom of the bowl – easier to take apart for cleaning. • Suction cup feet on the bottom: This is a nice feature that keeps the Bosch in place on the counter. The suction cups work great! • More mixing speeds than the older model: The new Bosch has one higher speed and one lower speed than the older model had. 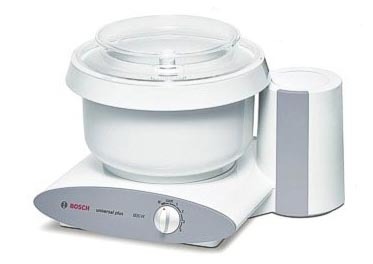 A: I have heard the Bosch blender is a very good blender, and I know it’s quite powerful, but I don’t personally own it. I use (and LOVE) the VitaMix. Good question about the attachments – I’d recommend getting the cookie paddles with the mixer as they come in very handy. The machine comes with the wire whisk attachment & the dough hook, and although you’re supposed to be able to make certain cookie dough recipes with the dough hook, the cookie paddles really work a lot better. They’re $29.99. You can get all kinds of different attachments for the Bosch. We just haven’t made it possible to buy them on our website yet. Some popular attachments are the grain flaker, meat grinder, pasta maker, and food processor. I’ve added the option to buy the Bosch with cookie paddles – they ship free when purchased together with the mixer. Thanks for the question! Let me know if there’s anything else I can do to help. Q: I’ve been thinking about buying the bosch but am wondering about the capacity. I know it will handle a lot of dough, but what if I only want to make a 2-loaf recipe or a standard choc chip cookie recipe? Can I do “small” batches in that big a mixer? I have been using my kitchenaid for 28 years. A: Yes, we use our Bosch for “small” batches like two loaves of bread or one recipe of cookies, and it does just fine. It may perform even better with more dough since a bigger recipe will fill the bowl more, but we’re perfectly happy with the results when we make small batches. Truthfully, I’ve never even tried mixing a really big batch of dough. We’d much rather have fresh bread every few days, so we usually only make 2 or 4 loaves at a time. Same with the cookies; I don’t think we’ve ever made more than one recipe at a time, and the Bosch works great. Depending on the recipe, I may need to scrape the butter down off the sides of the bowl a couple times, but I had to do that with my other mixer too. Hi Guys, I put the Pearl in there so you would know who I am. Wasn’t sure you would otherwise. Guess I could have said your next door neighbor though. lol Anyway, I wrote on another side but it was erased because I did not fill in all required info.